This caused water to get trapped between the crust and the core. 1b) Due to its low mass, any water that did get out before the crust was formed, got evaporated into space right away. 2) the mountain impact caused part of the solid crust (1) the put pressure on a water reservoir below … which (the pressure) got reliefed through the nearest crack, as a quick growing vulcano of water and regolyth (etc). This did not leave a bright spot due to the short lived overpressure and the regolyth vulcano plugging the fracture underneath. 3) the brightspot impact caused fractures in the solid crust (1) which allowed water to slowly vent, leaving a bright salt layer. How common is salt in space? Would an astronomical pipsqueak like Ceres retain a liquid core long enough to leach salts out of the surrounding rock and have enough gravity to allow them to concentrate? 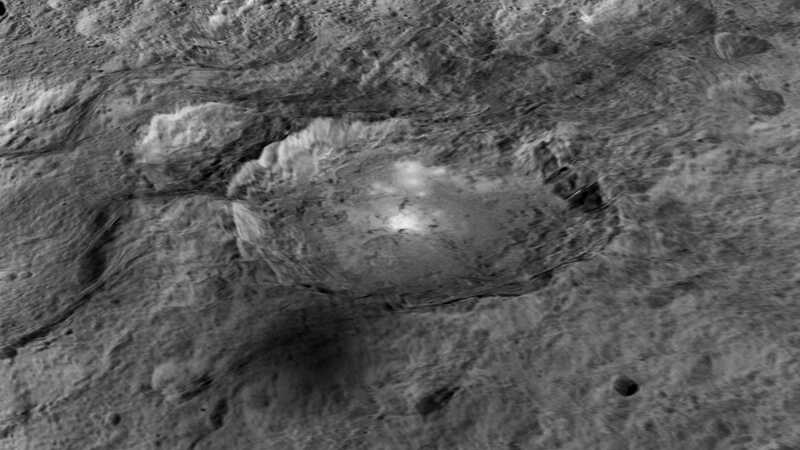 There are thousands other similar spots on Ceres as well, mostly in smaller size. It could be salts, frozen ice+salt mix, crystals+salt mix. Mt. McKinley was recently renamed as “Denali”. Next PostNext Could We Terraform the Sun?